This week had a lot of great firsts for me, it was my first time going to ELI, my first time meeting a lot of the people attending whose work I have been interested in and following online, and the first time for me to participate in VConnecting as an onsite buddy. 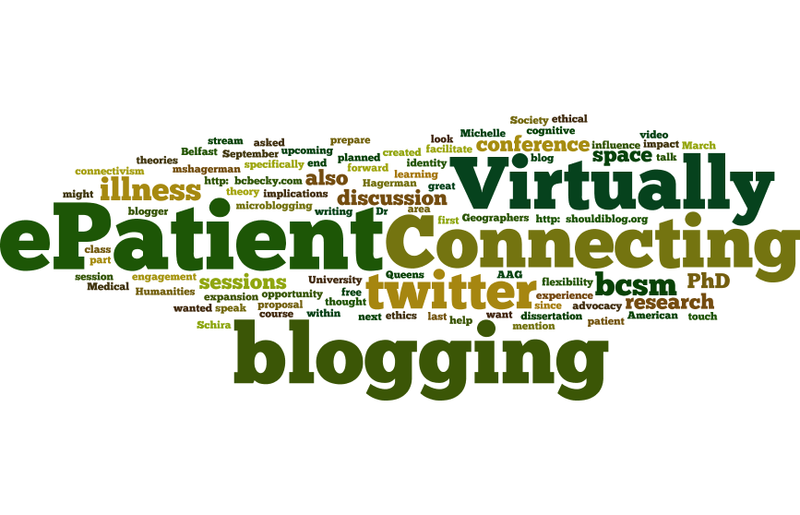 I have been aware of and have taken the opportunity to watch the VConnecting sessions at various conferences that I have missed and have really appreciated this look into the conversations around those conferences. I understand that one of the main purposes of VConnecting is to allow those offsite to be a part of the conversations happening around the presentations and speakers, but I also found that as an onsite person it is a great way to start making sense of the conference as a whole and reflecting on what is happening. I don’t know about others, but conferences for me (a total introvert) are completely overwhelming with multiple sessions, meeting new people, and having various conversations throughout the day. Part of that is also getting to know people, so there is a bit of life story telling intertwined with talking about the conference. There are also the normal conference factions, those who know each other and have been meeting at ELI or other shared repeated experiences. I walked into this connecting very much as a newcomer. A great line-up of guests (Gardner Campbell, Bryan Alexander, Michael Berman, Matt Crosslin on the first day and Kristen Eshleman, Kyle Johnson, joined by Raechelle Clemmons, Lee Skallerup, and Alison Salisbury on the second day) and of course Joe Murphy who was my fellow and more experienced onsite buddy. I was excited just for the chance to meet and talk with these folks. Something I wasn’t as aware of before the sessions was how much the virtual participants added and opened the conversation. They were watching from a different angle (or really several different angles and places) and asked questions that probably wouldn’t come up onsite, which was refreshing. The first session was at the end of the first day. Most of us had listened to Michael Crow, president of Arizona State University talk “What Can a Public University Really Do”? The room was absolutely packed, as only an afternoon keynote can do (no waking up early to get there). I was watching the Twitter feed and met up with a few people in the social time after to hear quite a bit of discontent and confusion about the message being given. What did he mean by “designer”? Did he give actual solutions to the problems he posed? The VConnecting session happened a few hours later. Andrea Rehn one of the virtual participants asked how Crow had set the tone of the conference. The guest speakers did a great job of bringing out what Crow did for the conference in terms of articulating some of the problems facing large public universities (or higher ed in general), and bringing up subjects that don’t necessarily get brought up in educational technology conversations like lowering cost and increasing access and university populations reflecting their demographics. Since there was also a push for more liberal arts colleges to attend ELI this year with sessions specifically liberal arts based, these topics all the more important not to forget. Trish later offered some insight on Crow, having followed his work and read his book, clarifying that he did probably mean everyone taking part in the actual design of courses when he spoke of everyone as designers. I’m going to leave that one there for now. On Wednesday at 8am, Randy Bass delivered his keynote “From Disruption to Design: Whole Person Learning in the New Ecosystem”. 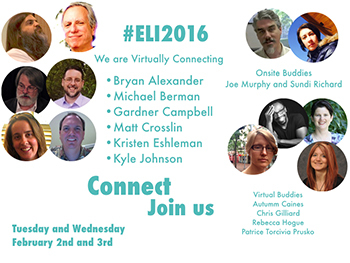 Twitter was again alive for #eli2016. I sat next to a faculty member from my institution who was greatly inspired and ready to start the day of the conference after the surprisingly funny talk. The VConnecting session was at the end of that day, so a lot had happened in between and I think this contributed to the fact that the conversation was less about the keynote and more influenced by the different sessions or encounters that people had throughout the day. What came out was more the feeling of the conference after day 2. Kristen mentioned that this was the most buy in she had seen at ELI and Lee pointed out that many of the people she met were quite new in their positions and seemed positioned for change. Raechelle talked about the panel that her and Joe Murphy sat on about the future of place based learning that liberal colleges offer, and the need to explore giving students something of the values and feeling of place in an online environment. For me these all point to the ecosystem that Randy Bass had talked about that brings every part of university life and people involved together to create an educational experience for the whole person. 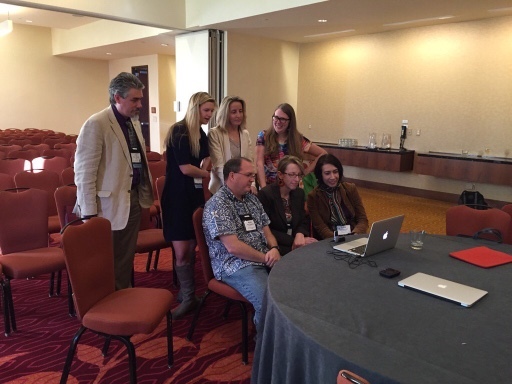 It could also be seen being enacted at the conference with more faculty attending and the push for collaboration between departments to get things done. The combination of attending ELI and getting to be a part of VConnecting definitely amplified my experience and take aways as I return to my institution and try to be a part of enacting ways to open and make whole learning experiences possible.